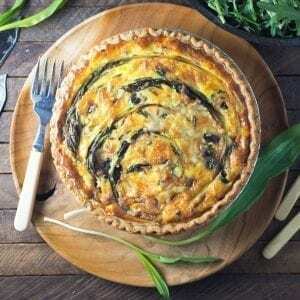 Quiche with Ramps (wild leeks), Bacon and Gruyere is fantastic any time of day. It’s creamy, cheesy and so satisfying. And don’t fret if you can’t find ramps, scallions make a perfect substitute. 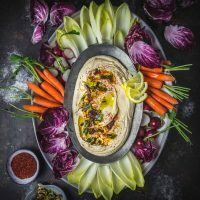 Spring has finally sprung in the Hudson Valley and, if you’ve been reading this blog for a while, you probably know what that means: the Cliftons have ramp breath. 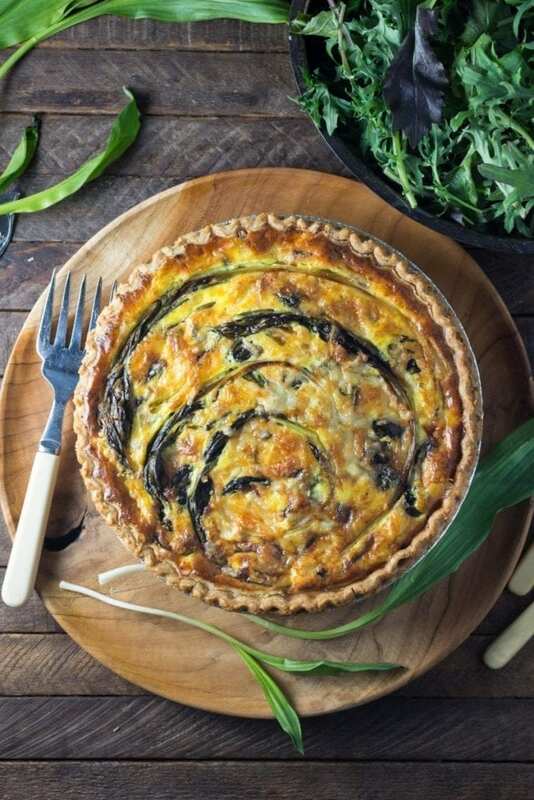 In the last week we’ve made sautéed ramps with mushrooms and fried eggs (delicious), spaghetti with ramps and brown butter sauce (heavenly), and this quiche, with ramps, bacon and gruyere. So, yeah, it’s been pretty rampy up in here. Ramps and eggs are a delicious combination. The ramps were foraged about a mile away and the eggs are from our chickens so this is just about as local as it gets. So, some of you might be thinking, “just what in blazes are ramps anyway and why does this nerd (with a knife) go so crazy for them?” Well, I’m glad you asked. 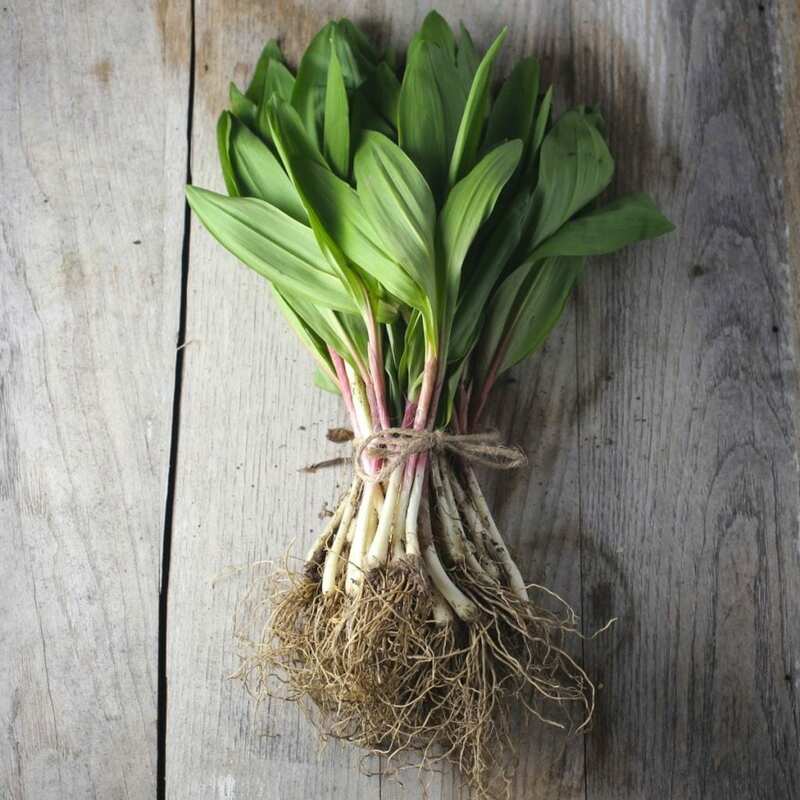 Ramps are wild leeks that grow in the early spring in Eastern Canada and the U.S. They taste like a mixture of garlic, onion and heaven. They’re pungent, a little bit sweet and extremely addictive. 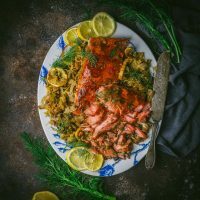 They can be prepared in a variety of ways, we especially like them pickled, sautéed with mushrooms, and mixed in a compound butter. They also make great pesto. While they might seem like some newfangled hipster fad, ramps have been a part of regional North American cuisine for centuries. They were foraged by Cherokees for hundreds of years, and they’ve been a staple ingredient in Appalachian kitchens for decades. The wild plants grow very slowly, taking up to four years to flower and reproduce. Ramps are only in season for a few weeks in the early spring so you have to enjoy them while they last. Note for foragers: Due to growing popularity, ramps are quickly becoming endangered. Do NOT dig up the whole plant – instead, cut the leaves from a plant and leave the stem and bulb. Even better, plant some ramp seeds or order some bulbs from the Ramp Farm to create your own patch. A nice bundle of ramps (though these were not foraged sustainably; see note above). 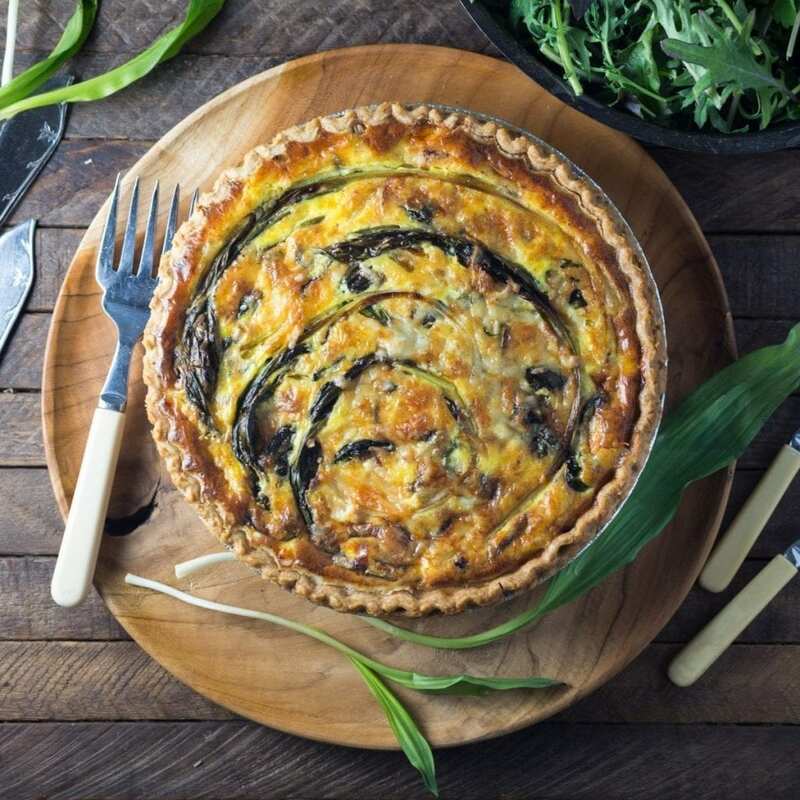 If ramps are not available, this quiche would be excellent with scallions (you can add a small clove of minced garlic to the pan along with the scallion whites, to mimic the ramp flavor). For a vegetarian version, use your favorite mushrooms in place of the bacon. I particularly like oyster mushrooms but crimini or shiitake would be good too. Brown the mushrooms well in olive oil or butter (this gives them great flavor but also helps evaporate the mushrooms’ high moisture content which can make the quiche soggy). Follow the recipe below the rest of the way. And now, a confession … look at the picture above. That, my friends, is a frozen pie crust. And you know what, it works great! While I’ve made my own crust for quiche and certainly will again, sometimes I just don’t have time. This week was one of those times. So using a good quality frozen pie shell turns a weekend project into a fast and easy weeknight option. Make sure you get a deep dish crust or you won’t have enough room for the filling. A note about quiche: basically, like a frittata, you can pretty much throw just about anything into it and it will taste good. In summer, I love to use fresh corn, scallions and cheddar. Another favorite is chard, caramelized onions and goat cheese. 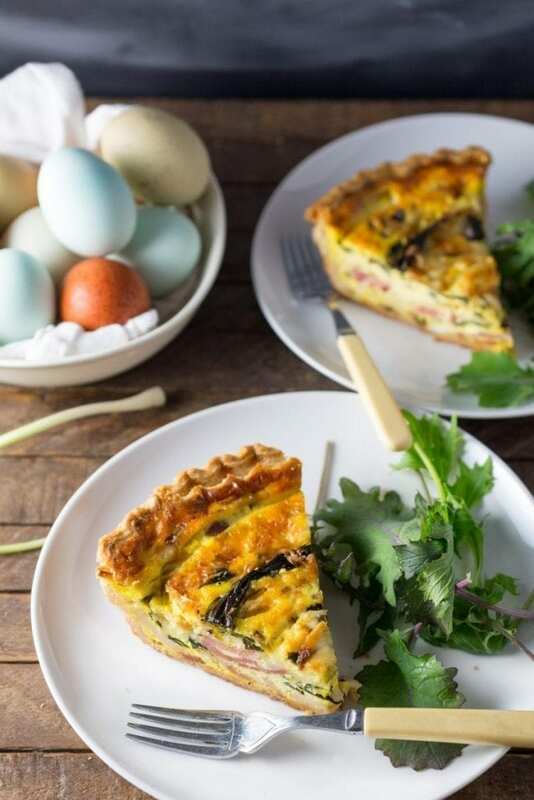 I like a creamy, custardy quiche and have found that Alton Brown’s refrigerator pie ratio is just perfect: 2 eggs to one cup milk, half and half or cream. Unlike his recipe, I like to use lots of fillings and add the custard almost all the way to the top of the shell. I just like how it looks without a rim of bare pastry at the edge. Definitely put foil down on your baking tray because it may spill over a bit as it bakes. Serve hot or room temperature. 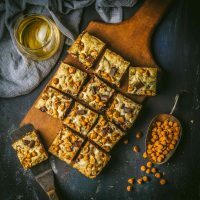 I love it with a green salad and a crisp, dry white wine. 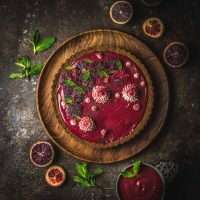 If using homemade, roll out the pie crust and press it into a large fluted deep dish pie or tart pan. Chop the bacon into large bite-sized pieces and fry in a large skillet over medium heat until cooked, but still chewy, 7 minutes. Set aside to cool. Remove all but 1 tablespoon of fat from the pan and add white ramp bulbs. Cook on medium until soft and slightly caramelized, 3 minutes. Add green ramp leaves and cook until wilted, 1 minute more. Remove and set aside to cool. Whisk the eggs and milk in a large bowl and season with salt, pepper and a small grating of fresh nutmeg, if using. To the pie shell, evenly sprinkle in half the cooled bacon, ramps and cheese. Pour over the egg mixture. Add the rest of the bacon, ramps and cheese. Bake on a foil-lined baking tray for 40-45 minutes. Allow to cool slightly before cutting. If ramps are not available, substitute scallions and add add one chopped garlic clove. This sounds so amazing and as always your photos are the bomb. Lovely post! I’m a terrible shade of green right now, envious of your beautiful eggs and foraged ramps! I’ve never had luck foraging for them near me so I have to make room in what little garden space I have for them. They’re worth it though! I love pickling them. I have made this 3 times- once with ramps and twice with green onion and it is always a hit! Any chance you have the nutrition info for this? I’ve been thinking about making it without the crust and am wondering if that will change the bake time?